The Mary Greenfield grave is located near the rock formation known as the Dutch Wedding Rocks on private property in Woodmen Valley owned by Mr. and Mrs. Joseph Barron. They have requested that the address remain confidential. According to GPS-derived geolocation (accurate to within 10 meters), the grave's coordinates are latitude 38°56'41.9"N and longitude 104°51'10.0"W. In 1956, the original wooden marker was still present. The infant’s sister Delia Greenfield Horstman replaced it with a flat granite marker in 1967, shortly before the Barrons bought the property. Mary Greenfield was a stillborn daughter of Albert J. and Maribie Clark Greenfield. Various accounts, quoted below, are given of her identity. 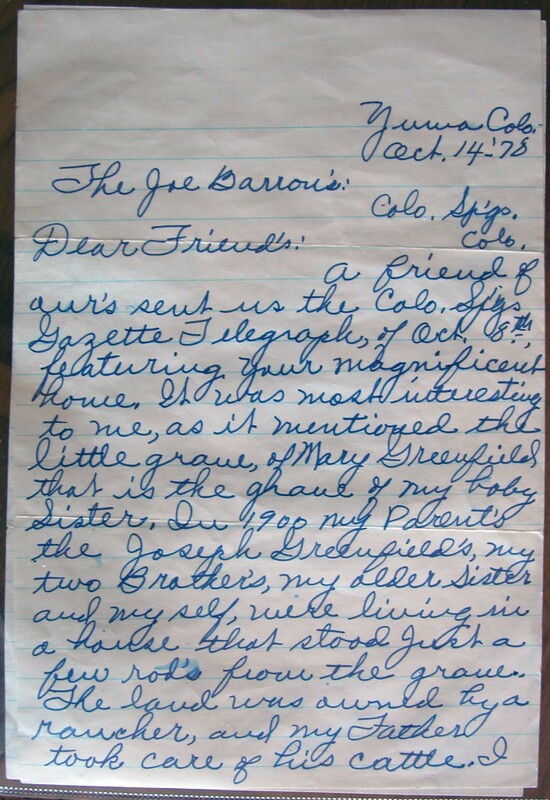 The 1900 census taker visited Edgerton precinct families on June 19 and 20, where he found the Greenfield family. The census lists Maribie as the mother of seven children, five living. Mary was presumably one of the two deceased children. 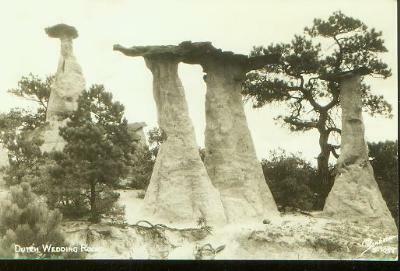 More information has come to light about the grave located at the Dutch Wedding Rocks on Golden Cycle Corp. owned property north of Woodman Road between Colorado Springs and the Air Force Academy. 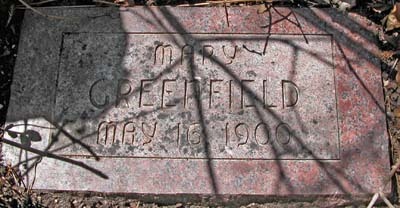 The grave is marked by a weather-beaten head board and the name of Mary Greenfield is clearly legible, but who she actually was and when she died have remained mystries for many years. The date of her death has been weathered away by the sun and the wind and the rain. But it has now been learned that Mary Greenfield died shortly before 1900 and was only three months old at the time of her death. it is now believed that she died after lightning had struck the Greenfield house which was located in that area. 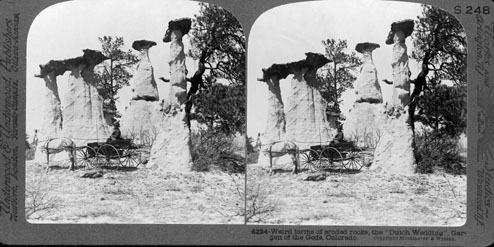 Mrs. Jean Greenfield, 3700 N. Nevada Ave., is a grand niece of the girl who is buried near the fantastic rock formation, which resembles a couple being “married,” complete with a “minister” and “wedding guests.” The grave is located on more than 500 acres of land which the Golden Cycle, thru its Pikes Peak Fuel Co., is selling off for homesites. The beautiful tract is known as Woodman Valley. A sister of the buried infant is Mrs. Katherine Greenfield Kutsinger of Parks, Neb., who is a grandmother of Mrs. Jean Greenfield. 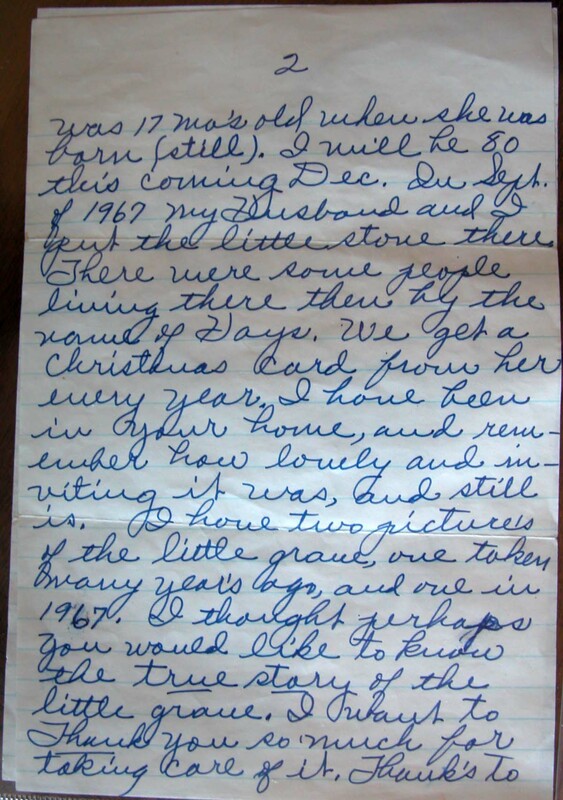 Mrs. Krutsonger is now about 77 years of age and Mary Greenfield was born before the Nebraska Woman. 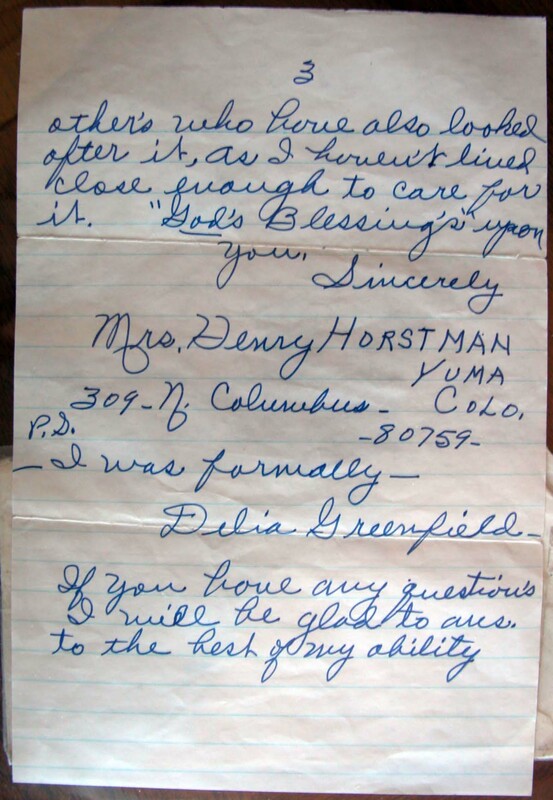 Most of the Greenfields moved to Yuma a number of years ago, Mrs. Greenfield reported. While the Dutch Wedding Rocks attract a great deal of attention so has the grave because of the missing date and, of course, its location. Even more attention has been called to the grave recently since hundreds of Pikes Peak Region residents have been touring the Monument Valley area after the Pikes Peak Fuel Co. had issued invitations to look over the scenic area as a home building site. There are two access roads into the area, both located near the Woodman school.